Every year without fail, the celebration of World Animal Day continues to grow, spreading its message to an ever-increasing number of people. For animals, October 4 is the most important day of the year. A huge variety of inspiring events were held. It’s something that everyone can join in with regardless of nationality, religion, faith or political ideology. Most importantly, events don’t need to be big budget affairs as this event organised by the Emperor Academy in Ghana shows. 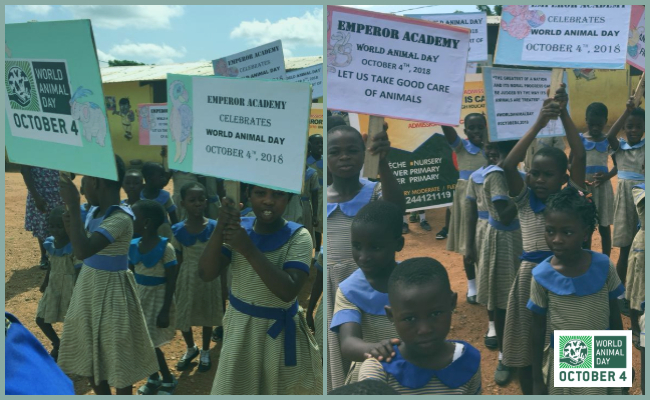 Children marched through the town asking their community to show compassion to all animals. There are other days linked to animals such as World Day for Laboratory Animals, World Wildlife Day and these are important too. However, World Animal Day is the one day of the year that embraces all animals and the unique concerns of each, in every country. 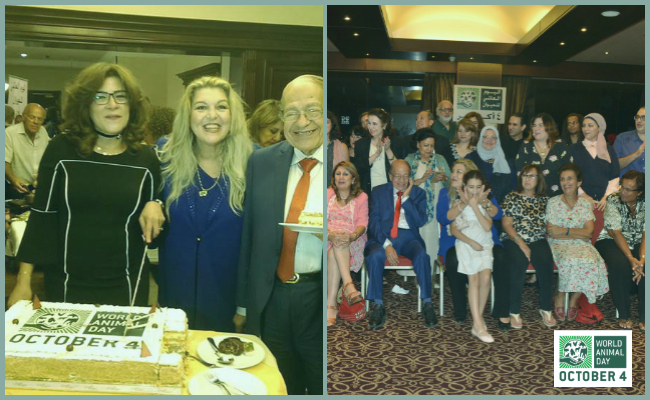 For example, Amina Abaza hosted a high profile event attended by celebrities and VIPs asking them to help highlight the plight of animals in Egypt after showing recent video footage which shocked everyone present. Spay Panama is another great example as the organisation holds a mega sterilization event for dogs and cats to celebrate World Animal Day each year. This year World Animal Day trended on social media in 32 countries, up from 25 in 2017, with increased support from Facebook, Twitter and particularly Instagram. Boosted posts to encourage people to show their support by adding the logo to their profile photo performed exceptionally well. What a fantastic way to help unite animal lovers from every corner of the globe. 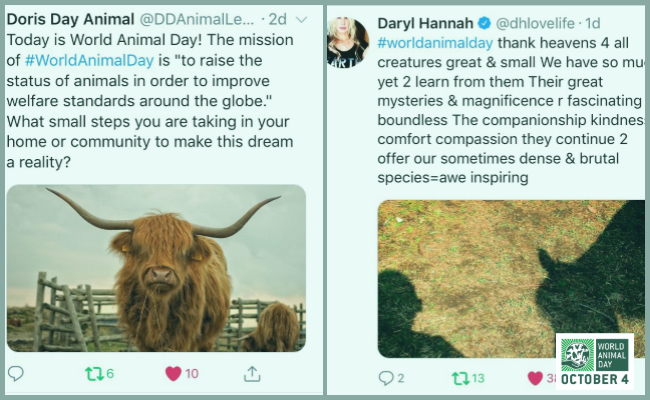 Patrons of Naturewatch Foundation (co-ordinators of the World Animal Day movement to raise the status of animals) pulled out all the stops to help keep social media busy. Some even made videos to share their personal message about this special day – Anneka Svenska, Dan Richardson 1 Dan Richardson 2, Chris Packham, Rula Lenska, Wendy Turner-Webster. Susan Richardson, our very own Poet-in-Residence published a specially written poem for World Animal Day 2018 ‘Dead Sky in the Mourning’ which she will recite at all her poetry events to help raise awareness. We lost track of the number of charities that rode the wave for animals. Here are just a few: Sea Shepherd, RNLI, Greenpeace, Born Free, Guide Dogs, Macmillan Cancer Care, David Sheldrick Wildlife Trust, Four Paws, Humane League, Guide Dogs UK, Badger Trust, SPANA, World Animal Protection, IFAW, WWF, RSPCA, PETA, Doris Day Foundation, Donkey Sanctuary,Foundation B. Bardot, Battersea, Dogs Trust, numerous wildlife trusts, libraries, museums, schools, art galleries, universities, and churches. As usual, huge support was shown by the media, media personalities and publications such as the BBC, ITV, Sky, Discovery Channel, Animal Planet, Good Morning America, HuffPost, Radio Times, and television stations in numerous countries. Countless publications around the globe, both off and online, engaged following our press release resulting in thousands of articles, press mentions, blogs and videos (like this one in India), many of which linked to the World Animal Day website. Once again, celebrities came out in force to show they care about animals including Ricky Gervais, Jackie Chan, Kristen Davis, Daryl Hannah, Peter Egan, Supervet, Alison Sudol, Kesha, Priya Kumar, Elaine Hendrix and Sidharth Malhotra. Not to be outdone, Harry Potter, Esther the Pig, Simon’s Cat, Peppa Pig, Bagpuss, Warhorse, Avatar, and Lego, among others, also jumped on the bandwagon to share in the success of the day. We can always rely on the sporting world to speak up for animals with major clubs and sporting personalities hot on social media throughout the world. 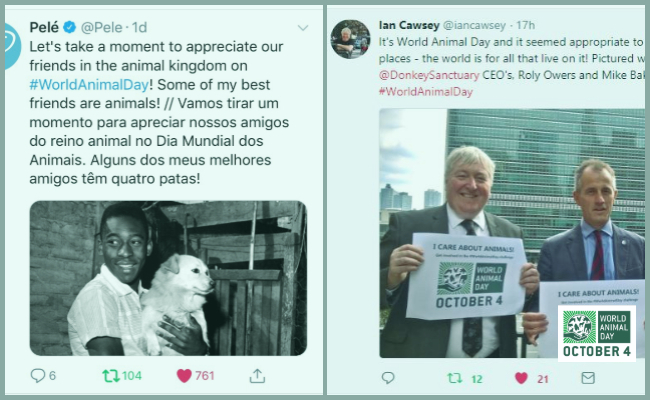 Every year we see an increase in the number of businesses who do their bit to highlight this special day and direct traffic to the World Animal Day website. Here are just a few: Bayer, Air China, Walt Disney, The Body Shop, Guinness World Records, Sony Music, TATA Group, travel agents, hotels, airlines, and pet-related businesses. NATO, United Nations, Governments around the world, Royal Navy, numerous political parties, European Parliament, police, fire and ambulance services, and even the Statue of Liberty helped to boost World Animal Day on social media this year. On behalf of the animals, we are immensely grateful to everyone who got involved this year and helped make 2018 THE BEST WORLD ANIMAL DAY YET! For every event that is registered on the website, Google searches show hundreds more took place around the world. Together, we will raise the status of animals to improve welfare standards.